If current laws and policies remain the same, world energy consumption is projected to grow by 50 percent by 2030, according to U.S. government energy statistics released in “International Energy Outlook 2008” by the Energy Information Administration. 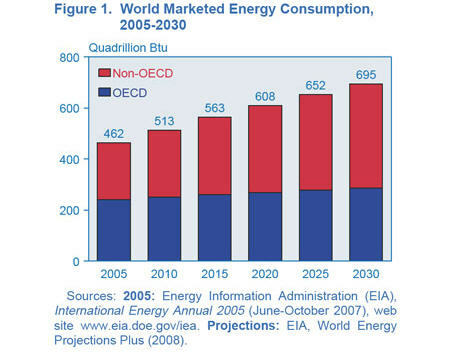 Global energy demand will grow despite the projections of long-term sustained high world oil prices, the report says. Total world energy use will rise from 462 quadrillion BTUs in 2005 to 563 quadrillion BTUs in 2015 and to 695 quadrillion BTUs in 2030, according to the report. Average world oil prices have been higher than the previous year’s average every year since 2003 and prices in 2007 were nearly double the 2003 prices in real terms. Coal’s share of world energy use has increased sharply over the past few years, and without significant changes in existing laws and policies robust growth is likely to continue. World nuclear capacity is projected to rise from 374 gigawatts in 2005 to 498 gigawatts in 2030. Nuclear capacity is expected to decline only in the EU, where several countries plan to phase out nuclear power. The report projects China to add 45 GW of net nuclear capacity over the projection period, India 17 GW, Russia 18 GW, and the United States 15 GW. The report, which does not include specific policies to limit greenhouse gas emissions, projects energy-related CO2 emissions to increase 51 percent from 28.1 billion metric tons in 2005 to 42.3 billion metric tons in 2030. Much of the increase in GHG emissions is projected to occur among the developing nations of the world, especially in Asia.